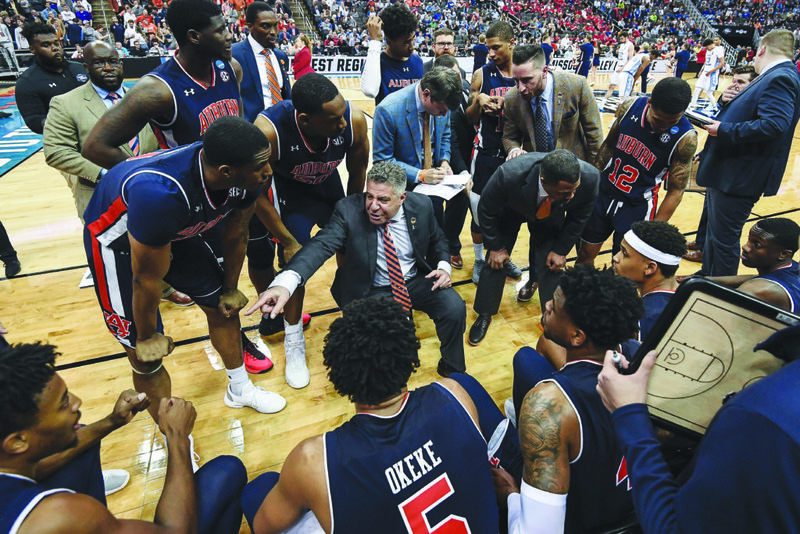 (JTA) — Bruce Pearl has won plenty of accolades and championships in a basketball coaching career spanning nearly three decades, including guiding the U.S. men’s team to the 2009 Maccabiah Games title. Now, however, he’s on the precipice of college hoops nirvana. On Sunday, Pearl’s Auburn University squad reached the Final Four with a 77-71 upset over Kentucky in overtime in the championship game of the Midwest Regional of the NCAA Men’s Basketball Tournament. Pearl, in his fifth season at the helm at Auburn, will lead the Southeastern Conference school to its first appearance in the national semifinals. It will be his debut, too, on the Division I level, though he had success at the University of Tennessee, another Southeastern Conference school, and Milwaukee. His Tigers will again be underdogs when they face the University of Virginia on Saturday in the semis in Minneapolis. Auburn was a fifth seed in the Midwest, while Virginia was the top seed in the South Regional. Before beating second-seeded Kentucky in a thriller, Auburn had defeated top-seeded North Carolina and fourth-seeded Kansas along the way — the three winningest programs in men’s college basketball history. Pearl would become only the second Jewish coach to lead his team to an NCAA men’s basketball crown. Larry Brown led Kansas to the title in the 1988-89 season. While Pearl, 59, has never reached the Final Four in Division I, the top level in college sports, he did win the Division II title in his first coaching stint, at the University of Southern Indiana. The Screaming Eagles took the crown in 1994-95, Pearl’s third season there, after being the runner-up the previous year. And of course there was the Maccabiah title on a team that included his son, Steven. Against Kentucky, Auburn tied the score with 37 seconds left and outscored the Wildcats, 17-11, in overtime. The Tigers not only overcame the higher-seeded club, but did so without one of their top players, forward Chuma Okeke, who injured his knee in the North Carolina victory and will be sidelined for the rest of the tournament. Should Pearl’s club defeat Virginia, it will advance to meet the winner of the other Final Four matchup between Texas Tech, the West Regional champion as a No. 3 seed, and Michigan State, a second seed that upended top-seeded Duke to emerge from the East Region. The national title game will be played on April 8.